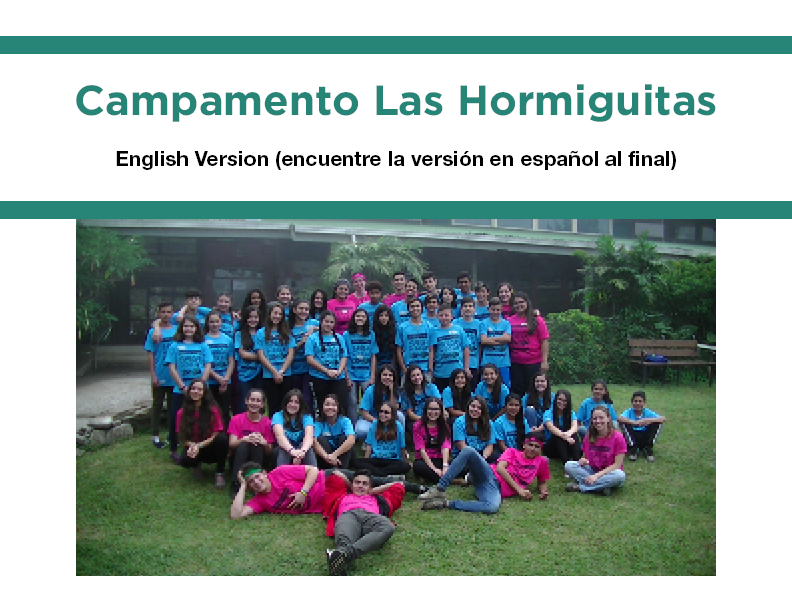 Campamento las Hormiguitas (Camp of the Ants) has completed the 7th season. When you teach someone something you know, you learn it better and that knowledge goes on to be shared again and again. El Campamento las Hormiguitas ha completado su séptima temporada. Cuando uno comparte con alguien algo que sabe, lo aprende mejor y ese conocimiento se multiplica una y otra vez. Tropical storms in Costa Rica have become stronger in recent years, more frequent, and are lasting longer since records began in the 1880s. Las tormentas tropicales en Costa Rica se han vuelto más fuertes en los últimos años, son más frecuentes y duran más en base a los registros que se comenzaron en la década de 1880. Young people are often told that they are the leaders of tomorrow. Jorie and Julia Bachus and their friends decided that they wanted to take the lead today instead of waiting. A menudo se les dice a los jóvenes que son los líderes del mañana. Jorie y Julia Bachus junto a sus amigas decidieron que querían tomar la iniciativa hoy en lugar de esperar. Así, estos jóvenes de entre 18 y 23 años estuvieron trabajando en conjunto con el Instituto Monteverde y la Asociación de Desarrollo Integral de San Luis en el mantenimiento del sendero Montecielo y la construcción de un sendero que conecta el Montecielo en forma de circuito (loop). Seminario sobre Decolonialidad. ¿Pero qué es decolonialidad? Cuando hablamos de decolonialidad, y esta es una palabra que se escucha cada vez más entre nosotros, queremos dar cuenta de una manera crítica de ser-pensar ante las estructuras heredadas del poder colonial. Reflexiones de una "pilarica" que vive en Monteverde. - Reflections of a “pilarica” that lives in Monteverde. Reflexiones de una pilarica que vive en Monteverde. "Uno siempre vuelve porque aquí está tu familia, aunque sea medio disfuncional a veces, pero es como tu familia y el bosque se vuelve como tu casa." --- Reflections of a “pilarica” that lives in Monteverde. " You always return because here is where your “family” is, even if it’s a bit dysfunctional, but it’s like this forest and it’s neighbour truly become your home." San Luis decidió construir un parque. Que se complemente como una oportunidad recreativa adicional. --- San Luis decided to build a park that will complement the other recreational opportunities. Educación, Género y Epistemología: Soñando espacios educativos para construir humanidad. Así tenemos que, desde el quehacer y teorías aprendidas bajo el esquema patriarcal o matriarcal, los espacios educativos, sean estos formales o informales, han heredado formas de convivencias que promueven, o mejor dicho, tienden a enfatizar visiones separatistas o integradoras, sesgadas o holísticas sobre la idea de género y sus múltiples dimensiones y complejidades. El proyecto de Monteverde en Movimiento ha sido una parte importante de la labor del Programa de salud del Instituto Monteverde desde noviembre del 2012, y ahora estamos felices de apoyar en la transición de este proyecto hacia la comunidad. --- The Monteverde in Motion Project has been an important part of the Monteverde Institute’s Health Program, we are now proud to say that we are transitioning this Project for management by the community. "It is a great privilege to have been in the right place at the right time, and through a quirk of fate in agreeing to take a hike with this man, have been given the opportunity to share his wonderful life. " ---" Ha sido un gran privilegio el haber estado en el momento justo en el lugar correcto, y que por un capricho del destino al aceptar ir en una caminata con este hombre, he tenido la oportunidad de compartir su hermosa vida. " At the Monteverde Institute we have been working hard on our vegetables gardens and our own MVI kitchen has been one of the places where we have enjoyed the produce the most. Incidentally this month we got a new stove, the best way to celebrate this was making Chiverre (spaghetti squash) empanadas from a chiverre picked straight out of the garden. ESPAÑOL: En el Instituto Monteverde hemos estado trabajando arduamente en las huertas y en la cocina del Instituto es uno de los lugares donde más nos hemos aprovechado de las cosechas. Este mes, además, conseguimos una cocina nueva y la mejor manera de celebrarlo era cocinando unas empanadas de chiverre con uno de la huerta. An internship courtesy of the Grace Elizabeth Groner Foundation in conjunction with Lake Forest College. The efficiency of land use on the Monteverde Institute grounds plays a significant role in the overall degree of sustainability of the Monteverde community at large. For this reason, creating a master plan to guide the use of land is of primary concern to Institute land users. Landscape architecture has taken on many definitions over the course of my internship. At its core, my internship has moved from obtaining information about the natural environment surrounding Monteverde, to gathering impressions of the Monteverde Institute from the nearby community, to plotting the infrastructural layout of the Institute grounds. All said and done, the purpose of my internship has been to get the ball rolling, to put it colloquially, in terms of efficient land use on the Institute grounds. The physical manifestation of this goal takes form as a landscape master plan. The master plan serves as a guide for future projects that deal with land development on the Institute grounds. Essentially, Monteverde´s unique environment, input from the community regarding desired directions of land use on the Institute grounds, and personal analysis gleaned from the creation of an accurate distribution plan have been blended together into an end product that should be phenomenally helpful in coordinating land use projects on Institute grounds. Communication between different users of the Institute property based on an agreed upon representation of the property is a great step towards coordinated land use and, ultimately, efficient land use. Early in my internship, research on Monteverde´s unique natural environment was crucial in order to gain an appreciation of the land on which the Institute is situated. For instance, Nadkarni and Wheelwright´s (2000) text, Monteverde, provided ample insight into aspects such as climate, vegetation, soil characteristics as well as other elements pertinent to my eventual work regarding low-impact land use in the region. Furthermore, Wolf Guindon´s narrative, Walking with wolf, written by Chornook (2008) gave a story of man´s quest to live off of the land while leaving as light a footprint as possible. Together the two texts served to familiarize me with the atmosphere the Institute operated in: the Institute acts in some ways as a mediator in the struggle to preserve the extraordinary wildlife of the region while catering to a tourist demand that has negative impacts on the very environment that inspires the demand. Points of interest at the MVI. After acquainting myself to the dilemma faced by Monteverde and the surrounding communities, I took up pencil and paper and set out to meet face-to-face with different members of the community. The meetings were unofficial interviews in which I recorded the interviewees´ impressions of the Institute and its land use. Interviewees ranged from staff at the Institute to Quaker practitioners living as far as San Luis. At that point in my internship, I was more of a social architect, as the interviews served to construct a mental image of what the Institute was in the minds of the community. With an understanding of where the Institute stood in terms of its physical location and with the community´s perception of the Institute in my mind, I began my work on the immediate property of the Institute campus. Armed with a tape measure I sent out among the campus taking note of the triangulated positions of every structure and feature that may be relevant to future projects. The process lasted weeks. Generally, I bounced from the office where I had a developing map draft on a large scale plan to the grounds where I would store measurement notes on a clip board to be transferred back to the office at a later point in time. Finally, the required measurements were taken and the final step of formalizing the drafts went underway. My supervisor closely guided me along the way as we moved from border design to texturing elements such as gravel roads to adding special interest layers. It is the distribution plan with its special interest layers that provide the bulk of the end products. The product that has arisen out of my literature study constitutes a small portion of the overall end product. Essentially, I have condensed scientific and social literature down to the most relevant information regarding land use on Institute grounds. This boiling down of information is found in my final presentation PowerPoint. Furthermore, the pertinent information that I felt was necessary in introducing the land use predicament special to Monteverde contains reference pages to sections in texts that elaborate on a finer scale the environmental or social issue to which I refer to in the presentation. The inclusion of reference pages will help future special interest projects cut time on the research stage of their project. Concerning the interviews, I have compiled many reports of how the Institute is seen by the community. Most of all, the interview reports serve as a checkup on how narrowly the Institute is conforming to its desired goal of being a sustainable voice in the area. The information from the reports has been charted several different ways. The analysis of the reports can be found in the discussion section. However, the ultimate gift to the Institute resulting from my internship is the distribution plan and its subsequent layers. The distribution plan details the layout of the property, again complete with all elements pertinent to future land use projects. On top of the distribution plan can be placed four special interest layers (more layers can be drafted in order to analyze different aspects of the property that may become of interest when future projects are being considered). However, the four current layers detail access and circulation routes, water ways and flood zones, forest zones, and special features to the Institute that add character to the land while having minimal impact. These maps will be the first maps that accurately communicate where land use has occurred and potential areas for future land use. Due to this, interns, workers, the community, and any other party interested in the lands on the Institute grounds will share the same understanding of the property on which the Institute is situated. The implications of the final products gain significance upon the review of a trained eye. Upon analysis of the interview reports, I found that the community desires that the Institute serve as a recreation center that emphasizes the nature present in Monteverde. As a recreation center, the Institute would provide the community with a space for activities as well as down-time pursuits such as chatting or reading. Most of the members of the community I spoke with were older and thus recognized that it will be the younger generation who will soon be responsible for staying committed to sustainability. Due to this, members expressed a palpable hope that drawing the community onto the Institute campus will inspire a respect for the land in the youth of the region. At first glance of the Institute maps, one might simply locate herself according to the other features of the property. Though maps serve to locate and contextualize the user according to her immediate location, the maps and ensuing analysis serve a larger purpose. Efforts towards sustainable land use can be significantly more efficient when users of the land share a common goal for subsequent land use. There have been several projects carried out by single groups of interns only to be neglected when the interns leave the Institute. The land used is then neglected as well and left to future interns to deal with wondering how to convert the land to their specific needs. Instead of having discordant users develop parcels of land for their select interest, an accurate map can serve to coordinate land use over the long run ensuring at the least a consistent use of land. The Institute is a gem in terms of property value. The difficulty in maintaining the gleam of the gem results from a population of users that sees the land as per select members´ individual, current interests. What belies sustainability is jumbled land use due to failures of carrying out long term visions. I mentioned this master plan was a way of getting the ball rolling in a sustainable direction. Yet, like past projects, the biggest threat to the success of this project is the lack of follow-through by a future intern. The ball may be rolling, but the friction of noncompliance has been a formidable force. Necessary to thank for this opportunity is the Grace Elizabeth Groner Foundation. Without their funding and oversight, this internship opportunity would not have been possible. The Foundation´s association with Lake Forest College enabled my participation in this internship. Furthermore, the direct supervision of primary coordinators Ashley Gora and Felipe Negrini required hours of time and a bundle of patience in mending my mind from an economic orientation to one of a landscape architect´s. I would like to thank them for their support over the course of my research. The Monteverde Institute, the community of Santa Elena and nearby towns, and all others who I cannot name person by person deserve my thanks, as they were extremely open and accommodating to the needs of my internship. It was a pleasure to have met those with whom I worked. Chornook, K., & Guindon, W. (2008). Walking with wolf. Canada: Wandering Words Press. Nadkarni, N., & Wheelwright, N. (2000). Monteverde. New York: Oxford University Press. 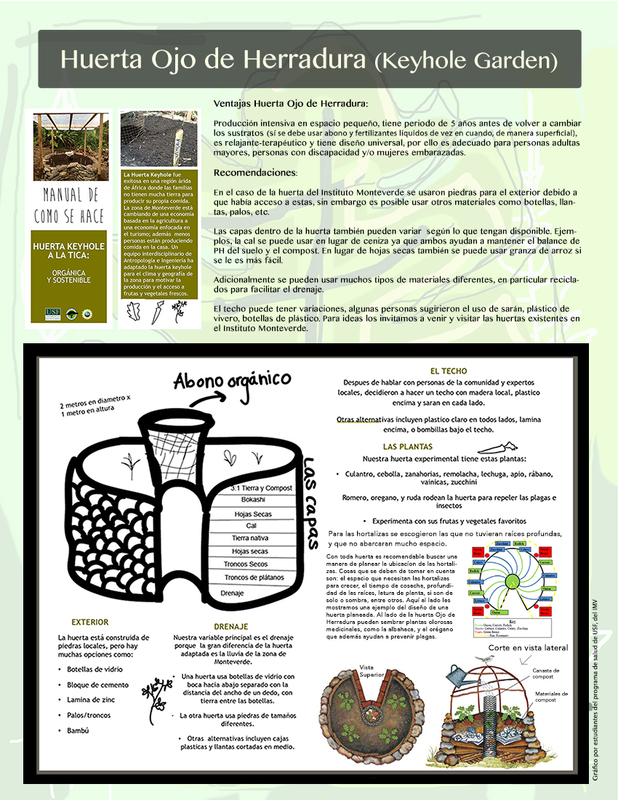 The Monteverde Institute does publications for the community in this case it's a manual on how to make a vegetable garden at home, this is the digital version, and we have a printed version at the MVI if you are interested. Recital de música en el Instituto Monteverde conAgustín León Ara y Andreu Riera. tags / Agustin leon ara, Andreu Riera, monteverde, instituto monteverde, monteverde institute, violin, violinist, pianista, costa rica, recital, 2013, noviembre, musica de camara, chamber music. Keyhole Garden- Jardín Ojo de Herradura-Costa Rica. Manual on how to make a KeyHole garden in the tropics. This is a high yielding agricultural system.---Manual de como hacer una huerta Keyhole en zonas lluviosas. Mapas del crecimiento de edificios en tres zonas del distrito de Monteverde: Los Llanos, Santa Elena y Cerro Plano. Por Samanth Copeland pasante del Instituto Monteverde.